The Verdict: I confess that going to the Gaythorne RSL I did not have high expectations for the chicken parmigiana at my local RSL. Suffice it to say, whilst my expectations were exceeded, this chicken parmigiana, with its fairly ordinary chips and salad and its tomato sauce on the top of the chicken piece, did not do enough to be Brisbane’s best. Chicken: The chicken piece on this Parma was a large piece that was well crumbed. It was well cooked but was, at best luke warm. As with a lot of this dish I had the impression that the whole of the meal was not cooked fresh but rather was put together from items sitting in a hot box. Tomato Sauce: As you can see from the photo, the tomato sauce on this Parma was placed on the top of the chicken piece. When one stands in the queue to order ones meal at the Gaythorne RSL you can watch one of the chefs adding the sauce to the top of the dish before it comes out. The sauce was good but again it was not above luke warm. Ham: A large slice of ham that covered the whole of the chicken piece came with this dish. This was the best part of the Gaythorne RSL chicken parmigiana. Cheese: The photo above does not really show you how the cheese was presented on the chicken piece. That is because the tomato sauce coverage hides, in the photo, the fact that the cheese did not cover the whole of the chicken piece or the ham. This was a disappointment because what cheese there was was excellently melted and tasted great. There just was not enough of it. Side Dishes: Both the chips and the salad of this dish suffered from the pre-packaged nature of how this dish was put together. Again, when one stands to order one can see the line of plates sitting on a bench at the back of the kitchen with the salad already set out. Again, it tasted nice enough but just was a bit rubbery. The chips clearly had been sitting in a hot box for some time but before they had gone in there they had not been well enough cooked. Presentation: This was a big enough plate to have all of the parts of this dish well spread out but instead the chicken piece was on top what were clearly already soggy chips before they got on the plate. The Venue: The Gaythorne RSL is in the suburb of Gaythorne in Brisbane’s northern suburbs on Samford Road. It is a large Returned Services Club with a significant gaming and TAB spaces and a large bistro. Social membership is $1 for life. My parma was $19.90 (with the member’s discount). The Final Word: For a quick midweek meal, this chicken parmigiana was OK, even accounting for the sauce being placed on top of the whole of the chicken piece. That said, I would not be rushing back to have another one given that across the whole of the meal there was something that let down each aspect of it. 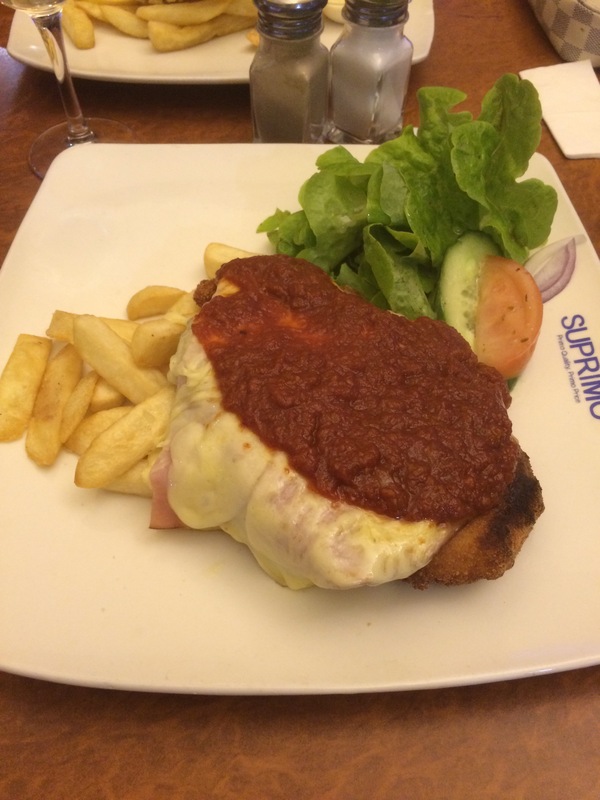 This entry was posted in Uncategorized and tagged Brisbane, brisbane's best parma, chicken, chicken parmigiana, food, gaythorne RSL. Bookmark the permalink.